Shield: Vert, an elephant salient caparisoned and trimmed, upon its back a howdah with four spears all within a diminished brodure or. Crest: That for the regiments and separate battalions of the Army Reserve: On a wreath of the colors (or and vert) the Lexington Minute Man proper. Description: The colors yellow and green are for Armor. 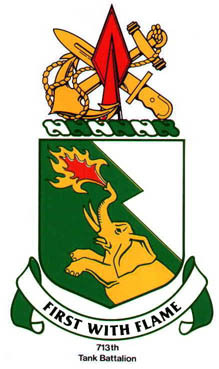 The charging elephant, taken from the shield of the parent organization and placed within a border, indicates descent from the former 42nd Armored Regiment. Decorations: Distinguished Unit Citation for action during the period 9-22 June, 1945, WD GO 47-46.